If prominent, misshapen or asymmetrical ears make you feel self conscious about your appearance, book a consultation to find out how our corrective procedures can help. Ear pinning surgery, also known as otoplasty, improves the shape, position or proportions of the ear. Otoplasty can correct a defect in the ear structure that is present at birth, prominence that becomes apparent with development - or misshapen ears caused by an injury. Otoplasty creates a natural shape, while bringing balance and proportion to the ears and face. 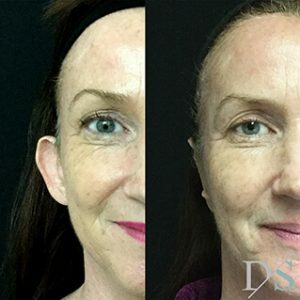 Correction of even minor deformities can have profound beneﬁts to appearance and self esteem. This procedure is most commonly performed in children, but can also be performed on teenagers and adults. If protruding or disﬁgured ears bother you or your child, book a consultation with a qualified specialist plastic surgeon to discuss otoplasty surgery. 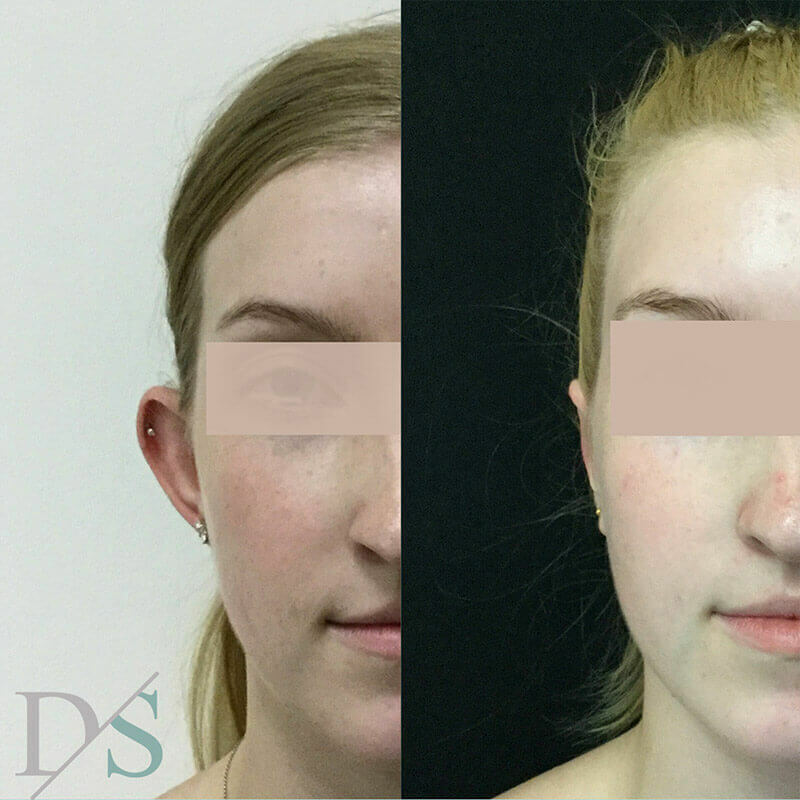 The images on the right show an adult female before and 3 months after otoplasty surgery performed by Dr Sharp. Is otoplasty surgery eligible for Medicare or private health fund rebates? In some cases, yes. 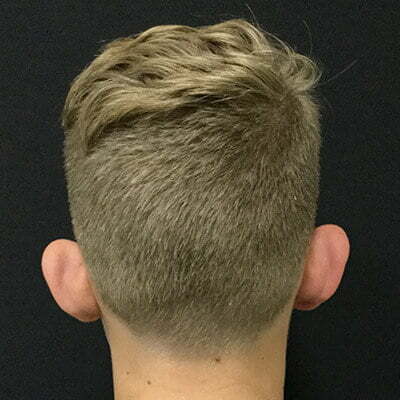 If you are aged 18 years or younger and have an ear deformity that causes your ears to be visibly prominent, a Medicare Benefits Schedule item number may apply. If you meet the criteria for this item number and have private health insurance, you may be eligible for rebates on your a portion of your surgeon’s fees, anaesthetist’s fees and hospital costs. If you don’t have private health insurance and you meet this criteria, Medicare may rebate a small portion of your surgeon’s fee and anaesthetic fees. 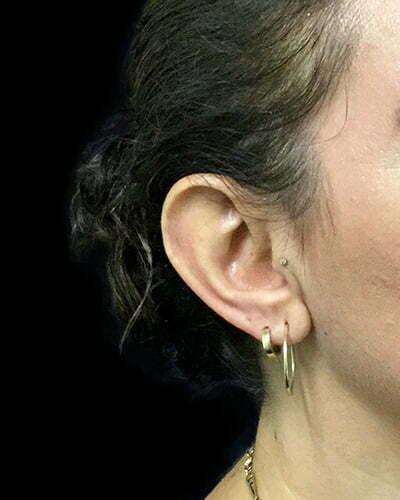 Individuals who have a positive outlook and specific goals in mind for ear surgery; this procedure improves the appearance of the ears, but it will not perfect the ears, so it’s important to have realistic goals and be patient as healing and scar maturation takes time. Most importantly, otoplasty is something you should only do for yourself - not to fulﬁll anyone else’s expectations about your appearance. Most otoplasties are performed under general anaesthesia, meaning you are asleep for the entire procedure. 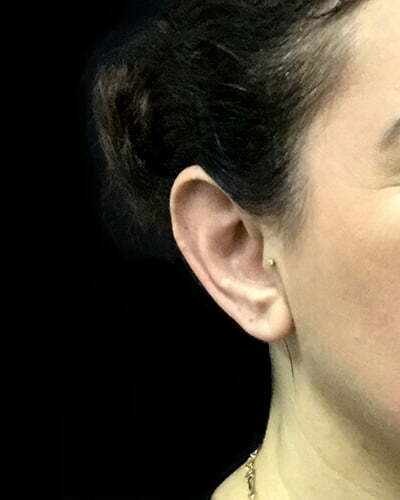 Correction of protruding ears uses surgical techniques to create or increase the antihelical fold (just inside the rim of the ear) and to reduce enlarged conchal cartilage (the largest and deepest concavity of the external ear). Incisions for otoplasty are generally made on the back surface of the ear. When incisions are necessary on the front of the ear, they are made within its folds to make them as inconspicuous as possible. Internal, non-removable sutures are used to create and secure the newly shaped cartilage in place. External stitches close the incision. 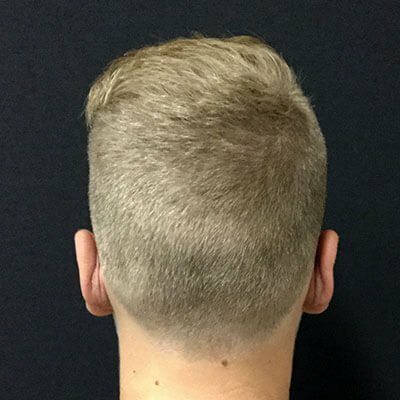 Techniques are unique to each case, taking care not to distort other structures and to avoid an unnatural appearance. You will wake up with a large bandage-like looking headband around your head, which will remain in place until it is removed at 1 week post surgery. Ear surgery offers near immediate results in cases of protruding ears, visible once the dressings that support the new shape of the ear during initial phases of healing are removed. With the ear permanently positioned closer to the head, surgical scars are either hidden behind the ear or well-hidden in the natural creases of the ear. Discomfort immediately following ear surgery is normal and can be controlled with pain medication. There may be an itchy feeling under bandages, which is normal. It is essential that bandages remain intact and are not removed, for any reason. Failure to do so may result in loss of some of the correction and may require a secondary surgery. It is important to avoid any activity that may bump or dislodge the dressings, and prop yourself up on pillow or in a comfortable armchair to sleep, so that you do not roll onto your side or disrupt the dressings. What will my dressings/bandages look like after surgery? When will they be removed, and how long do I wear my support garment? When can I resume normal activity/work/exercise? The decision to have ear surgery is extremely personal and you’ll have to decide if the beneﬁts will achieve your goals and if the risks and potential complications are acceptable. Your plastic surgeon and/or staff will explain in detail the risks associated with surgery. You will be asked to sign consent forms to ensure that you fully understand the procedure you will undergo, the alternatives and the most likely risks and potential complications. Be sure to ask questions: It’s very important to ask your plastic surgeon questions about your procedure. It’s natural to feel some anxiety, whether it’s excitement for your anticipated new look or a bit of preoperative stress. Don’t be shy about discussing these feelings with your plastic surgeon. Ear surgery should be performed in a hospital. It is usually performed as a day procedure, meaning you go home on the same day as your surgery. Dr Sharp operates from Southbank Day Hospital in Brisbane, Greenslopes Private Hospital in Brisbane and St Andrews Private Hospital in Ipswich. The success and safety of your procedure depends very much on your adherence to post operative instructions, and having open communication with your surgeon both pre and post operatively. You’ll be asked a number of questions about your health, desired result and lifestyle - it’s important to be honest, so your surgeon can assess if you are ready for this procedure.